Backed by a team of deft professionals, our enterprise is able to offer PP Flute Box with extreme quality. 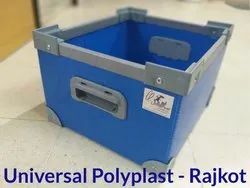 PP Flute Board Boxes & Crates and diverse designs and specifications as per their variegated needs and requirements. In order to glue together the PP to make the boxes, our experts make use of advanced bonding technique. The production method of interlocking tabs is considered to be more advanced than traditional ultra-sonic methods.